Painting of Mahatma Gandhi, c. 1946. Painting of Mahatma Gandhi, c. 1947. Ink portrait by Dipti of Mahatma Gandhi. Ink study by Dipti of Mahatma Gandhi. Painting of the Indian flag. Painting of the Indian independence flag. 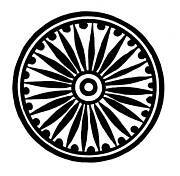 Painting of the Ashoka Chakra.